The World Molecular Imaging Congress is a large-scale international event where molecular imaging scientists come together to present their research to their peers. Typically, this kind of event is inspiring for those who attend and this was not different for the 2012 edition in Dublin. 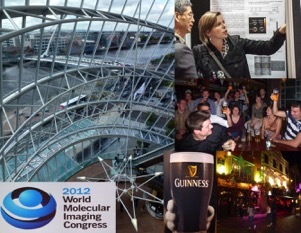 At the 2012 edition in Dublin, a group of Belgian junior scientists joined together during the long conference days (and even longer pub nights). Some knew each other from previous encounters, while others met for the first time. Somehow, not knowing whether it was during daylight or pub night, the idea of a similar small-scaled Belgian reunion was born. Why? First of all, it would be nice to know what our fellow Belgian scientists are working on. Moreover, talking about research drives research, so why not talk with the people close to us? Of course, ideas are often born as a spark, but need oxygen and fuel to grow into a flame and perhaps even a fire. In this case the spark had grown into a flame during WMIC-drinks and –dinners. But it was not yet full-grown. One month later, an organizing committee was formed and a first meeting was held on the 25th October at the bio-imaging lab at the University of Antwerp. A small group of enthusiastic junior scientists from the University of Leuven, Brussels and Antwerp joined together to work out the idea. It was then the BMIC was born with a nod towards the original event. Both principle investigators and imaging societies were fond of the initiative, resulting in a close collaboration with the European Society of Molecular Imaging (ESMI), under whose umbrella the Belgian congress is now organized. Exploring the small details of life starts with bringing people together. Therefore, the idea is to gather all Belgian molecular imaging labs and all other collaborating and/or interested groups. A few talks are organized to start discussions, but a lot of time is allocated to social and scientific interaction by means of poster sessions, as the organizing committee believes this is the driving force behind research. An evening dinner will be organized to conclude what we believe will be an inspiring and enriching day. To stick to all logic, the organizing committee has decided that the BMIC should take place before its parental events, namely EMIM (May) and WMIC (September). This meant less than half a year was left to plan and organize the event, imposing a huge challenge. The organizing committee has taken on the challenge and with the support of our academic and industrial partners, a sparkling event is under construction.